I've had this recipe from King Arthur Flour bookmarked/pinned for a couple years, waiting for the right opportunity to make it. OMG, why did I wait? They are super tasty. I loved the lemon curd and the cake, which has buttermilk in it, is superb on its own. They do take a bit of time and a little finesse, but nothing extraordinary; although the results definitely are. 1) Preheat the oven to 400°F and line a 12-cup cupcake or muffin pan with paper liners; spritz the liners lightly with cooking spray. 2) To make the cupcakes: Place the following in the bowl of your mixer: the cake flour blend, baking powder, salt, baking soda, sugar, butter, egg, vanilla and Buttery Sweet Dough Flavor. Add 1/3 cup of the buttermilk. 3) Blend the mixture on medium speed for 2 minutes. The mixture will be thick at first, but will smooth out as you mix. 4) Add the remaining 1/3 cup buttermilk and mix on medium speed for 1 minute. Scrape the bottom and sides of the bowl, and mix briefly, if necessary. 5) Fill each well of the pan 2/3 full, and bake the cupcakes for 15 to 18 minutes, until they're light golden brown on the edges. Remove them from the oven, and immediately transfer them from the pan to a rack. Cool completely. 6) Combine all of the lemon curd ingredients in a pan on medium heat and stir well. 8) Core each cooled cupcake with a cupcake corer (or an apple corer), leaving a small well in the center of the cake. Fill to the brim with cooled lemon filling. Fill all cupcakes, then prepare the meringue. 9) To make the meringue: In a very clean work bowl, whip the egg whites and Bakewell Cream or cream of tartar until soft peaks form. Add the salt. Gradually add the sugar, increasing the whipping speed and continuing to whip until the mixture is light and billowy, and stiff peaks form. 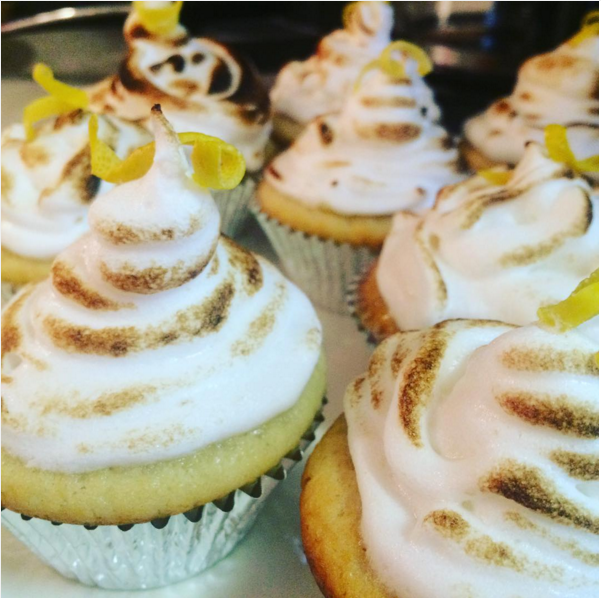 10) Mound or pipe meringue onto each cupcake, then toast the meringue with a cook's torch; or carefully broil until golden brown. Serve warm, for a flowing lemon lava; or cool for a more set filling.